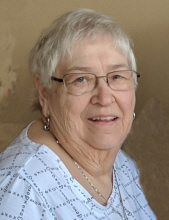 Her Legacy… Janet Louise Allen, passed away April 12, 2019. She was born on October 24, 1943, in Detroit, Michigan to Walter and Mildred (Green) Crawford. Janet married the love of her life, Robert Lee Allen Sr., on September 1, 1962, in Dearborn, Michigan. Jan loved her family dearly, enjoyed camping, crocheting, and playing on her Kindle. She could often be found sneaking pieces of candy to eat, doing her best to destroy the evidence, but crinkling of candy wrappers always gave her up. Jan will be missed by all who knew and loved her. Her Family… Janet will be missed by her children, Robin Brause, Pennie (Paul) Schell, and Robert (Anne) Allen; siblings, Donald Crawford, James Crawford, and David Crawford; grandchildren, Michael, Abbey, Kenneth, Joseph, Jasmine, Drew, Margaret, and Alex; great grandchildren, Brooklynn, Lilli, and Mila. She is preceded in death by her spouse, Robert Allen Sr.; parents, Walter and Mildred Crawford. Her Farewell… Janet’s family and friends will gather 2:00pm-8:00pm (7:30pm prayer service) Monday, April 15, 2019 at Borek Jennings Funeral Home, Lamb Chapel. Her Community Farewell will be held 11:00am (10:00am Gathering) Tuesday, April 16, 2019 at Heart of the Shepherd, 228 N Burkhart Rd, Howell, MI 48843. Pastor Galen Grulke will serve as celebrant. Memorial contributions are suggested to Heart of the Shepherd Church. Please leave a message of comfort for Janet’s family at 1-877-231-7900, or sign her guestbook at www.borekjennings.com. To send flowers or a remembrance gift to the family of Janet Louise Allen, please visit our Tribute Store. "Email Address" would like to share the life celebration of Janet Louise Allen. Click on the "link" to go to share a favorite memory or leave a condolence message for the family.